I am Marta Selusi, I have studied Fine Arts, be specialising in traditional illustration and fantasy graphic novel. Ever since I graduated, I have been working on comic projects, by my own and with writers, and portfolio. My mission is to tell stories with pictures and to illustrate texts, so I provide creative solutions of personalised art with custom-made projects adapted to the client needs. The only one thing I want is to be happy, and the thing that makes me the happiest girl in town is creating my characters with their fancy armors and magic weapons, drawing my sword'n'sorcery comics and painting my fantasy illustrations of warriors ready for battle (and playing Yu-Gi-Oh! TCG). With auttumn colours made with watercolours and inks, with free lines and opened forms, that's how my stories take shape. I love it, and I really would love making a living of it, what is more, my life would have no sense if I don't dedicate myself to it, so kafkaesque. JOURNALS. Free content for everyone. Every now and then. This content includes: goals and schedules, updates about projects, tumblr posts (regular sketches which from now on will also be posted here) and Black Wood Stories. SKETCHES. 1$ tier. Weekly. More elaborated sketches of character designs and illustrations, with personal notes. Some of this content will be posted later on tumblr. COMIC SKETCHES. 3$ tier. Exclusive sketches and pencils I draw for comics. This includes comic project I'm currently posting here and on Tapastic, but also sketches of projects I have on my mind. Very little of this content will be later posted on tumblr. COMIC PAGES. 5$ tier. Every 15 days. Previous access to finished comic pages of the project I'm currently working on (THE LAST QUEST right now). Some chapters will be posted on Tapastic, however, there will be exclusive chapters only available to you, and in the case I could print the comic for some miraculous reason, available in the printed version. VIDEOS. 10$ tier. Once a month. Full video of the making of an illustration made during the month. A fragment of the video will be posted on YouTube. ILLUSTRATIONS. 20$ tier. Twice a month. Full HQ PDF of all the illustrations I do, but the commissions, of course. Some of them will be posted on social media, but not all of them. 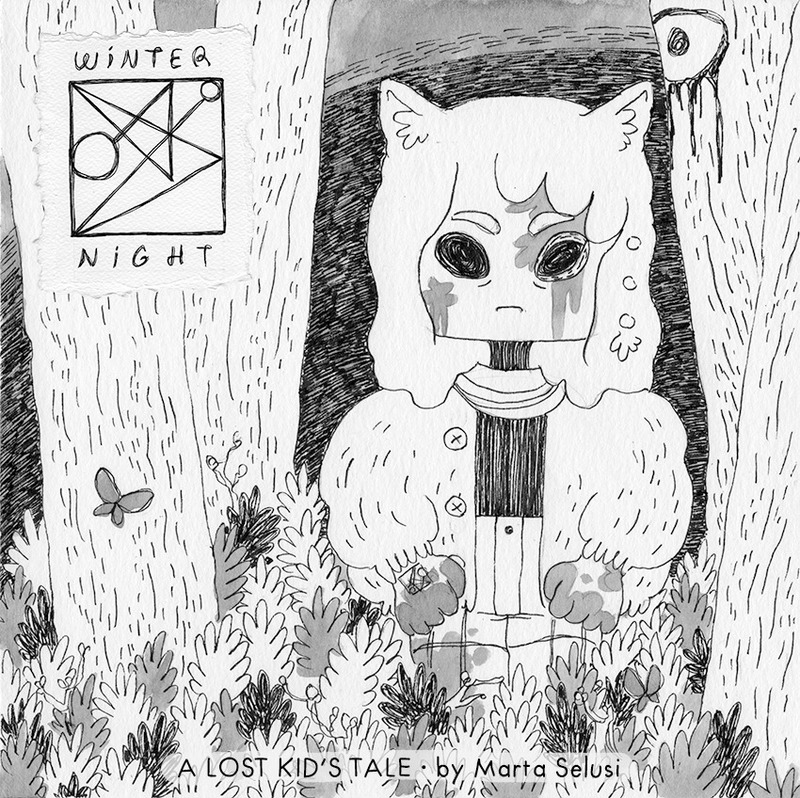 The main comic project I am currently working on is tittled WINTER NIGHT: A Lost Kid's Tale, a short fantasy story about a kid with anxiety who gets lost in the woods while searching for his friend. All patrons will have prior access to the comic pages which will eventually become Patron-exclusive. Some of the chapters will be eventually published on Tapastic. So, every kind of help is truly appreciated! For real! Your donation means so much to me, even if it's just a dollar. SKETCHES. Weekly. Elaborated sketches of character designs, with descriptions and ideas for illustrations, with personal notes. Some of this content will be posted later on tumblr. COMIC SKETCHES. Exclusive sketches and pencils I draw for comics. This includes the comic project I'm currently posting here and on Tapastic, but also sketches of projects I have on my mind. Very little of this content will be later posted on tumblr. COMIC PAGES. Every 15 days. Previous access to finished comic pages of the project I'm currently working on (THE LAST QUEST right now). Some chapters will be posted on Tapastic, however, there will be exclusive chapters only available to you, and in the case I could print the comic for some miraculous reason, available in the printed version. VIDEOS. Once a month. Full video of the making of an illustration made during the month. A fragment of the video will be posted on YouTube. ILLUSTRATIONS. Twice a month. Full HQ PDF of all the illustrations I do, but the commissions, of course. Some of them will be posted on social media, but not all of them. I can even buy some art tools from time to time! Raffle time! A free commission for the lucky one among my patrons, which will be shipped for free to its very own home!